I am an absentee ballot voter in DC and had seen the PoPville item on postage and absentee ballots. I called DC Board of Elections [DC BOE] and asked if or how much postage was required to mail an absentee ballot. At first, I was told “a stamp” would do it, then I was told “two stamps” “should” cover it. I asked what “two stamps”? I was told “regular stamps”. 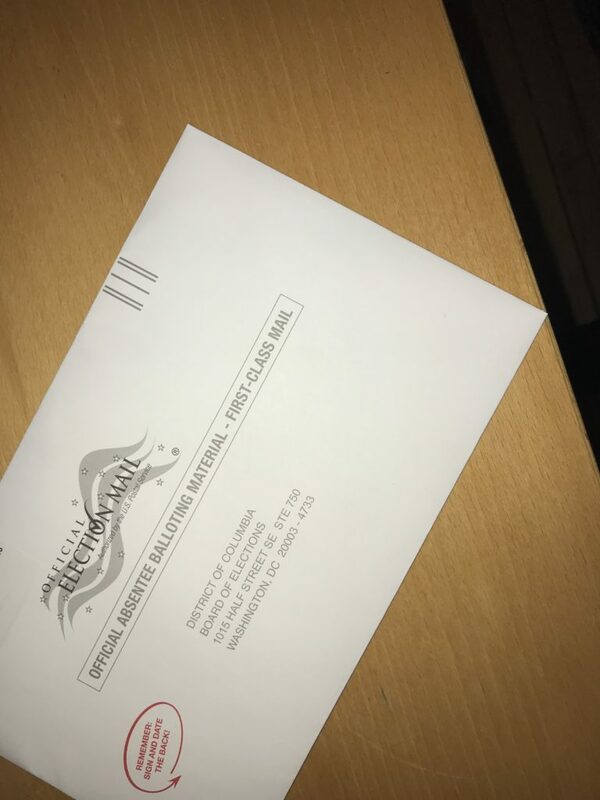 I also asked why there was nothing on the envelope to indicate if postage was required or that additional postage was required as there has been in past elections. The mail in envelope used to state in the top right hand corner that additional postage was required. I asked how much postage exactly was required to mail in my ballot. Why should someone use $1 when 65 cents might be enough? I was transferred to someone’s voicemail. I then called Councilmember Charles Allen’s office and spoke with Sonia Weil about the situation and I mentioned that people on Popville said their ballots were returned for lack of postage. Ms. Weil called very soon thereafter and said she spoke with the DC BOE Director who said the message about additional [or any] postage on the envelope was not there due to a “printing error”. I asked why this ‘”printing error” had not been addressed by the BOE in materials sent to voters or on its website. She also stated that the Director could not say the amount of postage required because people put all sorts of extra material in the envelope. I asked what the postage should be if you followed the instructions and submitted what was required. The Director said ballots are delivered without postage or sufficient postage and the USPS takes the amount due from a BOE account. I reminded her that people on Popville said their ballots had been returned due to lack of postage. Ms. Weil also said she had forwarded the Popville item to the Director. I told her there was nothing on the DC BOE website, FAQs or in the absentee ballot instructions received by voters that mentioned anything about postage at all. Ms. Weil said that the Director said DC BOE was going to put out a tweet about this and address it in other ways. Johnnie Walker White Walker arrives in D.C.